Heavy bags and sagging appear under the eyes when water pools within swelled tissue. This is a common occurrence when you're stressed out, eating more salt than usual, or missing out on that elusive eight hours of sleep. It is important to soothe the under-eye area in order to help the fluid drain and prevent it from building up over time. While a spa day may be out of the question, take some time before bed for a treatment that will have you looking bright-eyed and well-rested once again. Soak two cotton balls in cold milk and squeeze out the excess. Milk will reduce swelling. Lactic acid in milk restricts blood flow to lighten the area and will make any remaining swelling less noticeable. Lie down and hold one cotton ball under each eye for three minutes. Rest your eyes while the milk sets in. Remove the cotton balls and use a clean cloth to gently wipe away any remaining milk from the eye area. 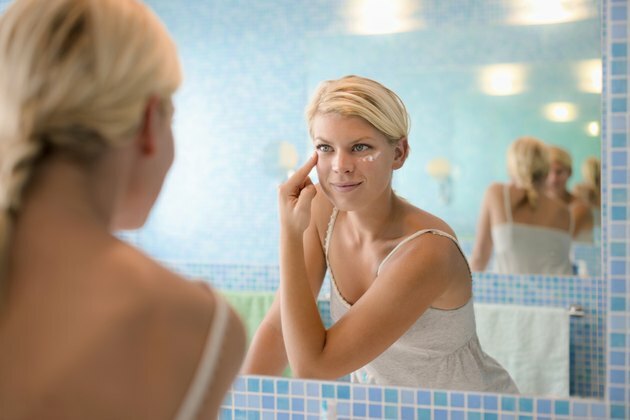 Use your ring finger to pat a dime-sized amount of eye cream directly under each eye bag. Use a caffeine- or vitamin C-rich eye cream to strengthen collagen. Eye cream travels up as it is absorbed, so placing it just below the bags will ensure that the proper area is treated. Tear off 1/2-inch strips of paper medical tape. Place the strips directly on the under-eye puffiness before getting into bed to prevent fluid from collecting overnight. Keep the tape on overnight. Wake and remove the tape to reveal a bright, well-rested appearance.